Based on a popular Australian show, this reality show is shot entirely on location throughout the United States. Every day, the men and women of the Department of Homeland Security patrol more than 100,000 miles of America’s borders — including airports, seaports, land borders, international mail centers, the open seas, mountains, deserts, and even cyberspace as well. In each episode, viewers are shown eight or more locations on the “front lines” where the officers and agents work each day. Their job is sometimes dangerous, difficult, and always unpredictable. The Department’s missions include everything from vetting adoption papers and checking visitors’ passports to intercepting undocumented immigrants, drugs and other contraband, and stopping potential terrorists from crossing U.S. borders. Their work is often powerful, dramatic, unforgettable and emotional, with unexpected moments of humor. The show’s camera crews have been given unprecedented access to the agencies of the Department of Homeland Security and has the full cooperation of CBP (Customs & Border Protection) including CBP’s Border Patrol; ICE (Immigration & Customs Enforcement); TSA (Transportation Security Administration); USCG (United States Coast Guard) and USCIS (United States Citizenship & Immigration Services). Episode 13 — Strip Clubs. Open on Thursday. 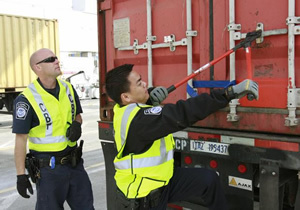 Customs and Border Protection (CBP) officials continue their work to keep the country’s borders safe. Cases covered in this episode include: a man who’s swallowed 40 capsules of heroin to conceal them, a woman trying to enter the country for prostitution, a man who’s been deported from Canada five times, a search for diesel fuel that brings surprising results, and two homeless men who are trying to sneak illegals over the border. Also covered are an Italian couple who are suspiciously trying to reenter the country, two outdoor chefs with unusual tastes, a father and son travelling from Jamaica, a canine who sniffs out a hard to find container of drugs, a woman who’s trying to bring $150,000 worth of Viagra into the country, and a family who’s been waiting 20 years to legally enter the United States. First aired: September 6, 2009. There’s been no new of plans to revive the show. Glad to see the American public didn’t swallow the government propaganda and support this Nazi-esque disgrace. With the DHS posting their taxpayer-paid “turn in your neighbor” television ads in retails stores and hotels and sexually molesting our citizens in airports on a daily basis, it’s a wonder anyone ever supported garbage like this. I am very dissapointed that this show was cancelled. It was one of be better shows on tv.